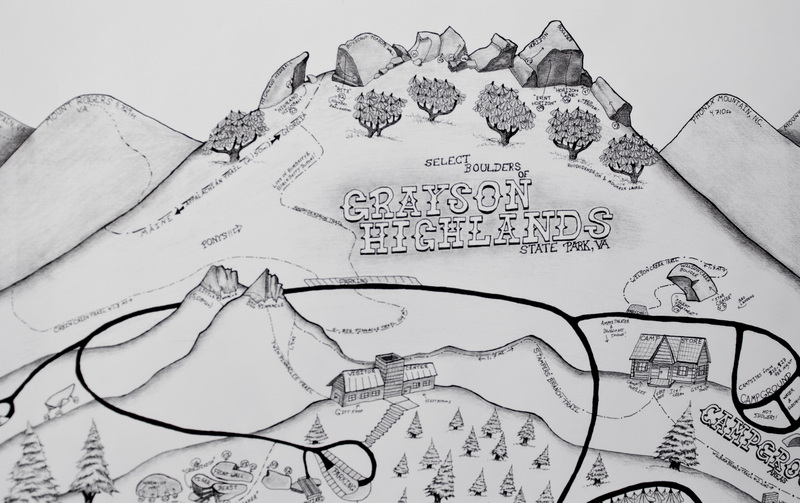 Creating a large-scale landscape drawing of the boulderfields of Grayson Highlands State Park is something I have always wanted to do since first laying eyes on the awesome Lineville Gorge prints by Joey Henson. 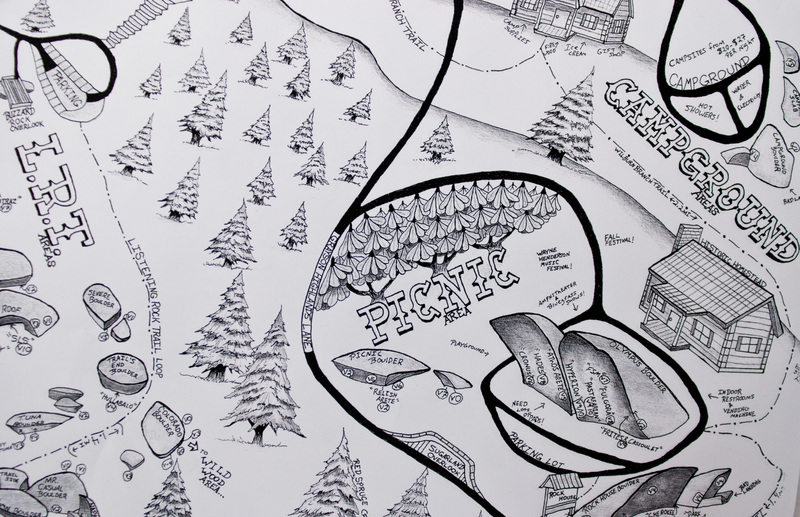 I have always stared at the maps Joey illustrated and thought that “one day” I would do something like this. 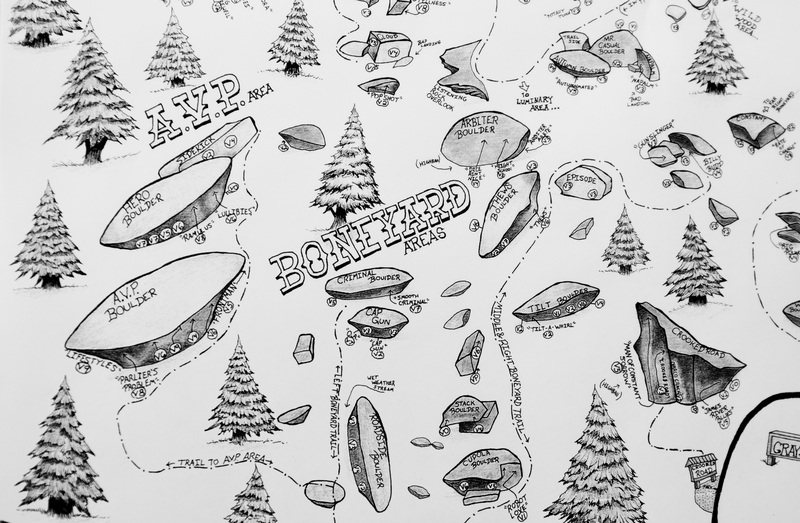 After moving here to Boone and seeing Jeffery Bonatti’s awesome work on the Ruff Guide map of the park, I decided to finally start something of my own. A lot of folks don’t know that once upon a time I was actually a pretty good artist, although I have admittedly not retained that skill set after nine years of not drawing or sculpting. As a high school student I had the option of heading to college on an art scholarship, but instead I went on a long vacation to Afghanistan with the 82nd Airborne and the rest has led me here (thank goodness). With that being said, I was apprehensive going into this process. Up until this I really hadn’t done much more than a few comical sketches of professors in my notebook during college seminars. I went to look at Joey and Jeffery’s work to glean more inspiration, and then the art supply shop here in Boone for some basic stuff. I decided to do my own unique portrayal of GHSP. I did the landscape in pen and graphite and wanted to capture the frontier, exploratory feeling I get every time I go to the park. Both in part from the Appalachian frontier vibe Grayson has kept alive in the historical aspect of the place, and too, in my own exploration of Grayson’s bouldering. I sat nervously in front of the blank page for quite some time. Finally, with pen in hand, I put ink to paper and it was on. I worked on the map for two weeks and decided it wasn’t what I wanted and trashed it. Round two, I flipped the paper to a lengthwise landscape and was able to format it to suite the cascade of boulders better and to get the mountains of VA and NC in a more balanced position. This allowed me to capture over 200 various (popular and obscure) boulder problems and allude to new boulders and areas that are now under development. 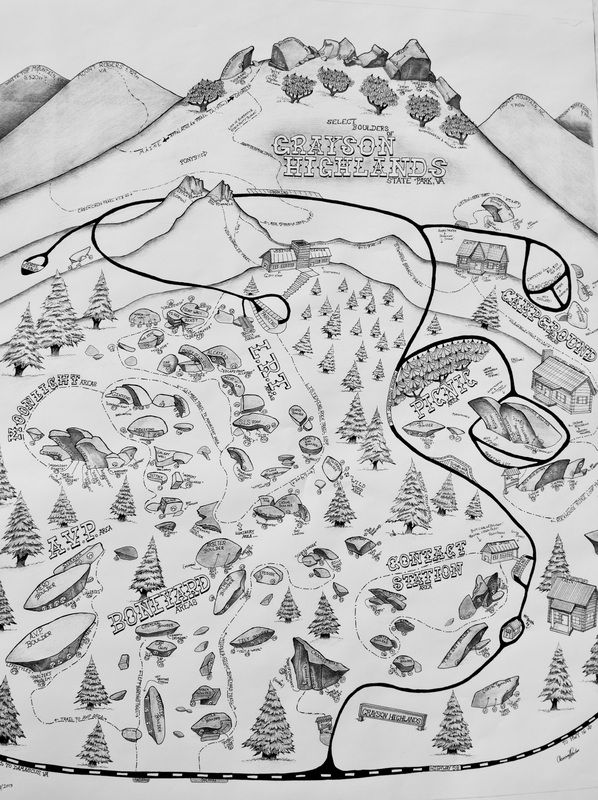 The park trails are drawn in showing the name and mileage (as well as the Appalachian Trail and the new Split Rock bouldering trail that will be constructed during the GHSP Trail Day this summer with the Access Fund). Many landscape features, park buildings and cabins, and park fauna are shown. I tried to include things such as restrooms, amphitheaters, bluegrass shows, blueberry patches, landing and highball aspects, and where to rent a crash pad and buy chalk. I wanted the person viewing the map to be able to stare at it for a while, but still see something new the next time. Or, just click the “GHSP Map” page tab at the top of the screen and follow the link. I hope you all like them! These drawings are SICK and add so much character to it……..Great job man! I’m excited to buy a book when they come out. Thanks so much Luke! It means a lot to hear good things about it from folks. I stared at this for so long that I couldnt tell if it looked good or not. The book should be out this Aril/May! Psyched! Just in time for good conditions.